Jenna Blogs: Day Four: 12 Days of Goodies! Day Four: 12 Days of Goodies! Kim from The Kauffman Family is the featured goody blogger today! Thanks Kim! Cream together butter and sugar until smooth. Add egg yolk and beat well. Add almond extract and flour, stirring well. Spread dough in an UNGREASED 10x15 pan. Beat egg white and brush on top of dough. Smooth and lightly press almonds on top of batter. Bake at 275* for one hour. DO NOT OVERBAKE. While still warm cut four strips lengthwise and six strips crosswise. Then cut each square in half diagonally. 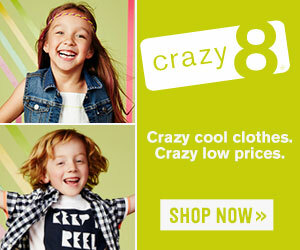 My Very Own Cyber Monday Deal! Brody's First Birthday Party Details! DAY 12! 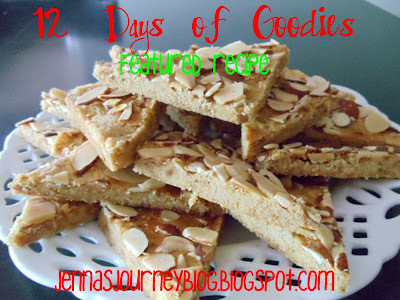 Last recipe of the 12 Days of Goodies! PART 2 - Day 11 of the 12 Days of Goodies! Day TEN! 12 Days of Goodies! Day 9 of the 12 Days of Goodies!! Day 8!!! 12 Days of Goodies! 12 Days of Goodies - Day 7! Day 6! 12 Days of Goodies! 12 Days of Goodies - Day Five! 12 Days of Goodies - Day Three! 12 Days of Goodies - Day One! 16 Blog prompts for when you're stuck!